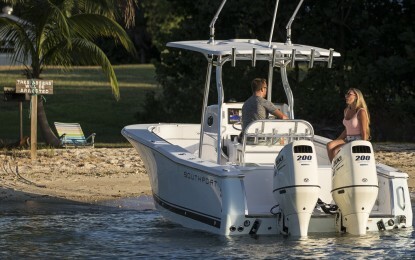 Photoshoots are really important to selling boats, especially good looking boats. The next best thing to a ride on the boat is a great deck of photos or video. Because of that, we try to do 1-2 photoshoots per year to keep the website and brochures fresh, but also to show off new models and upgrades on existing models. This year we did a major shoot with Onne van der Wal in Fort Lauderdale which included some beach and lifestyle shots, and some shooting out in the Gulf Stream while trolling. We have worked with Onne before, and even though he’s more famous for his work shooting sailboats he’s a pro and an artist (and Southport are gorgeous) so he always makes the boats look their best. In one set of photos, if you look closely you will see that beside the Ice Blue 272 TE there is a sign on the beach stating that “Trespassers will be Arrested”; I can tell you first hand that the sign was most certainly not a prop. After a few minutes of shooting on the location, the clicks of the DSLR were interrupted by a surly voice asking “if we’d seen the sign”. The answer to that question did not matter, so after a quick back and forth about land ownership limitations in public waterways we were shooed away, off in search of another beach to use. But every dark cloud has a silver lining: after that encounter we decided it was best to head out the inlet and grab some shots of the 272 TE charging through lumpy afternoon seas in the magical sunset lighting. 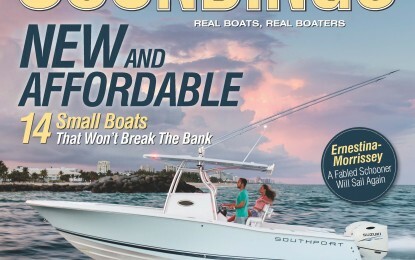 One of those shots was deemed gorgeous enough to grace the February 2016 cover of Soundings, which is a true honor for Southport as a boat builder, our photographer, and even this part-time “model”.